Radio historian Hans Knot has been sorting through papers and memorabilia, collected by the late Carl Mitchell during his offshore career. 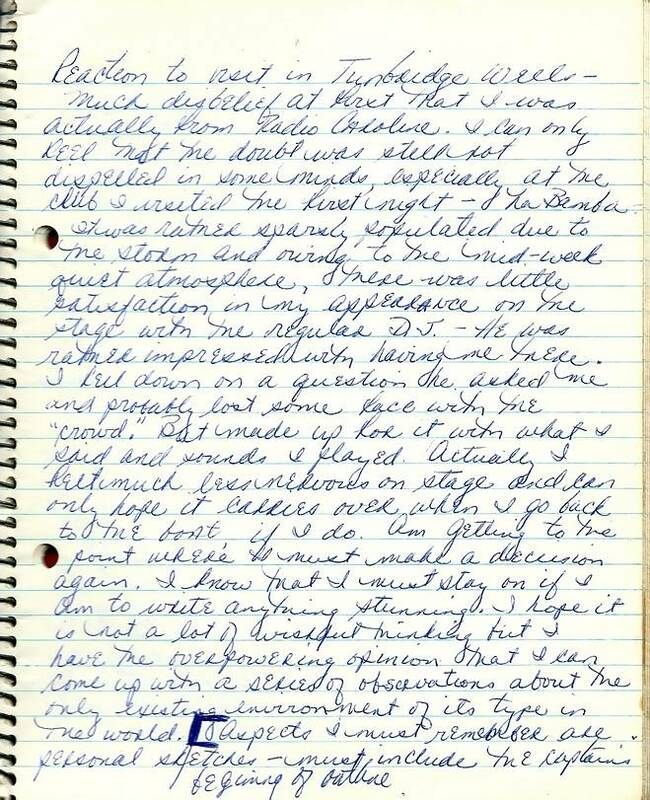 He came across some pages that Carl had written about his time on Radio Caroline South - part diary, part outline for a possible book and part plans for the future. Our thanks to Hans for sharing them with The Pirate Radio Hall of Fame. The first page mainly consists of Carl's thoughts after doing a club gig in England. He was new to broadcasting and, judging from his comments, hadn't done much live DJ work either. Towards the end of the page Carl begins to sketch out his ideas for an intended book. This outline continues on the following pages. The reference to Carl's gig in Tunbridge Wells surprised us as we weren't aware that the Caroline DJs made any public appearances in the UK after the passing of the Marine Offences Act. 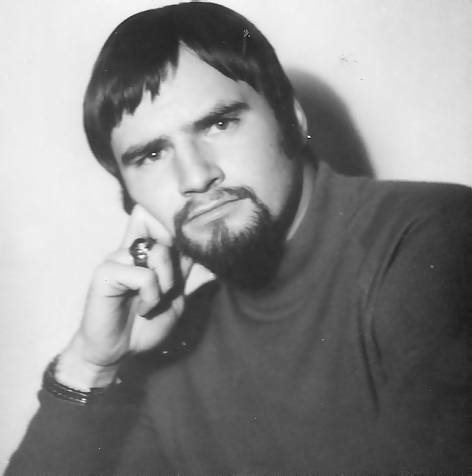 We asked if anyone could provide more information and in April 2015 The Pirate Radio Hall of Fame heard from Roger Munday: “I was the DJ at La Bamba, Tunbridge Wells, when Carl Mitchell ‘The Weird Beard’ did the spot mentioned in his notes. I remember him not quite believing that Roger Munday was my real name for some reason. I remember he obviously wasn't used to live performing, as his microphone technique wasn't up to much, as he was struggling to be heard. He was impressed by the stuff we played, being largely Stax and Motown, so we got a couple of ‘brownie points’ for that. He wasn't on for long, I think he just came along unannounced.” So it sounds as if it wasn't a formal Caroline gig - just Carl dropping in at a local disco while on shore-leave. Our thanks to Roger for getting in touch. 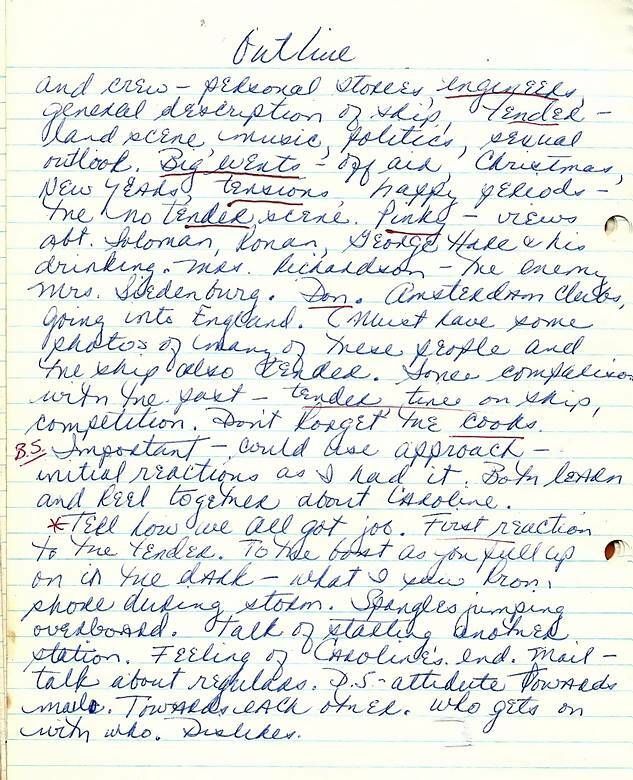 Page two of Carl's notebook continues with his outline for the planned book about Radio Caroline. Although it is little more than a list of subjects he intends to cover and he does not go into any great detail, it still gives a fascinating insight into life on board the Mi Amigo during the period after the passing of the Marine Offences Act and what was of concern to the DJs. Carl refers to Pinky Siedenburg, who worked in the Amsterdam office; Philip Solomon the owner of Major Minor Records who was effectively running Caroline then; Ronan O'Rahilly, the station founder; George Hare, the shore-based liaison man; husband and wife team, Don and Nan Richardson - he was an engineer on the ship, she was the office administrator; and the “Spangles” Carl mentions, of course, was his DJ colleague Spangles Muldoon. ....and crew - personal stories, engineers, general description of ship, tender - land scene, music, politics, sexual outlook. Big events - off air, Christmas, New Year, tensions, happy periods - the no tender scene. Pinky - views about Soloman (sic), Ronan, George Hare and his drinking, Mrs. Richardson - the enemy Mrs. Siedenburg. Don. Amsterdam clubs. Going into England. (Must have some photos of many of these people and the ship, also tender.) Some comparison with the past - tender times on ship, competition. Don't forget the cooks. Important - could use approach - initial reactions as I had it. Both learn and feel (?) together about Caroline. Tell how we all got job. First reaction to the tender. To the boat as you pull up in the dark - what I saw from shore during storm. Spangles jumping overboard. Talk of starting another station. Feeling of Caroline's end. Mail - talk about regulars. DJs' attitude towards mail. Towards each other. Who gets on with who. Dislikes. Carl worked on Radio Caroline International from September 1967 until the station was closed down in March 1968. These pages of notes are undated but page two refers back to Christmas and New Year so it must have been written after these events. On the previous page Carl mentions having to decide whether to return to the ship when his shore-leave ends which suggests he is on land at the time of writing. Carl had two periods of leave during 1968. After working over Christmas and New Year, he went ashore on 2nd January, returning to the ship on the 24th of that month. He then spent over a month at sea, going ashore again on 27th February. He was still on leave when the ship was silenced on 3rd March. Thanks to Geoff Toon for supplying these dates. You can see more of Carl Mitchell's papers at www.hansknot.com (pdf format).